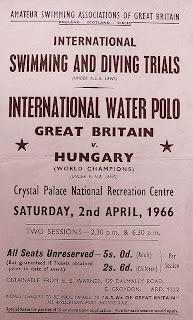 Poster of the International match of Hungary against Great Britain in 1966. There has been the first International appearance of Istvan Szivos Jr. The team of Hungary: Miklos Ambrus, Istvan Szivos, Zoltan Kasas, Laazlo Szlawka, Janos Konrad, Peter Rusoran, Ferenc Konrad, Gyorgy Karpati, Zoltan Domotor, Andras Bodnar and Denes Pocsik. The team of Great Britain: John Towers, Anthony Whittington, Roger Baylis, Michael Hale, John Sheshkar, James Dickenson, James Tancock, Murray Anderson, David Wright, Brian Flook. Hungary won the game with 7-0.